Kevin Rudd is back. Last week he was blitzing the country with a whirlwind book tour, having flown in from New York where he continues his post-prime-ministerial life as President of the Asia Society. He is promoting volume one of his autobiography entitled Not for the Faint-hearted. I caught up with him at Australian National University where he met in conversation with Stan Grant in front of a large crowd. The evening was replete with policy wonkery, self-mockery, anecdotes reflecting poorly on political foes and well on political allies, profound abstract insights, and homely truths such as 'We Australians are at our best when contributing to the world rather than cutting ourselves off from the world'; 'We need to be more than China's quarry and Japan's beach'; and 'The Chinese would be surprised if we didn't stand up for where we come from' — the 'where' being the world of the Judaeo Christian ethic, universal values, the Enlightenment, rationalism, and human rights. 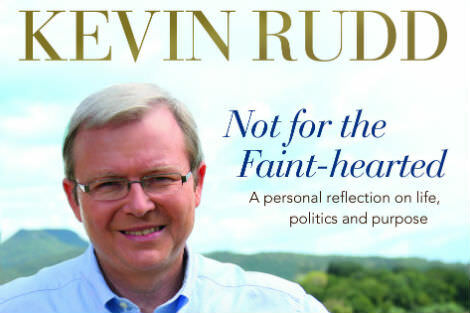 The book is dedicated to Rudd's wife and children with deep gratitude 'for a lifetime of care, love and support' and 'without whose love, care and nurture, my life would be small indeed'. Many times, key political decisions were made with Thérèse and Kevin joined for a tea ceremony on their four-poster bed with children Jessica, Nicholas and Marcus. The author acknowledges his debt to the editors 'who had to deal with the full, daily and detailed dimensions of the author's predisposition for bucketloads of programmatic specificity'. Returning to Australia when Malcolm Turnbull's hold on power is looking tenuous and when Labor in opposition is starting to look a credible alternative, Rudd hopes that his account of political ascendancy 'will encourage the next generation of progressive political leaders to don the armour, enter the arena and write the next chapter in our history — a history not just for the few, but the many'. Rudd and I have been friends for more than 25 years. In the early days, our relationship hit a rocky patch when I had the temerity to tell him that his proposal for prompt legislation for Aboriginal land rights in Queensland by the Goss government in 1991 would not be well received unless there were appropriate consultations with Indigenous communities. Having received advice from Aboriginal leaders like Marcia Langton and Noel Pearson, he had advised the premier Wayne Goss to legislate promptly so as to avoid political haemorrhaging. Goss and Rudd led the Labor Party in Queensland espousing land rights prior to Mabo, only to find that the Aborigines knocked down the gates of parliament house protesting the lack of consultation. I said, 'I told you so.' There followed a period of no-speaks. But then Kevin came back to me, and we cemented the friendship. I tell the story now, only to make the point that in politics there are often tensions, misunderstanding, and wildly differing perspectives. But for anyone to survive and thrive in public life, reaching the prime ministership, not once but twice, there is a need for strong personal supports and the capacity to transcend misunderstandings. "He went onto the public field to play this deadly game in order to make a difference. His family and his faith have sustained him every step of the way. His family has paid a price and he feels that deeply." Rudd has produced a 674-page account of his life, but only up to his first election as prime minister. Now that takes some chutzpah. Despite the detail in the book, he deals with the 1991 Queensland land rights exercise with one economical sentence: 'On social reform, we introduced, amid considerable controversy, Queensland's first land rights legislation for Aboriginal people.' Within two years, Goss and Rudd were to find themselves on the rough end of the pineapple when dealing with Paul Keating over native title in the wake of the Mabo decision. In one of his earlier meetings with Keating, Rudd was told, 'Kevvie, in politics we don't have a lot of time to play with. We are designed as fighter aircraft. We are here to find the target, do the deed, and get the hell out of there if you can. We are not Lancaster bombers, lumbering along, as if they had all the time in the world, waiting to be shot down.' Political autobiographies are inevitably filled with personal reminiscences about all manner of meetings which add colour and flavour to the already accepted public narrative. After all these years you can still feel the searing hurt. Rudd told Stan Grant that his mother was a great model for him urging him to throw all life's hurts into the forgettery. No forgettery seems big enough for our public figures. With no Chilcot Inquiry, we Australians have not made a full reckoning of our involvement in Iraq and the consequences. Rudd is scathing of Howard's 'arrogance and hubris' and claims that by the change of government in 2007, much of the government's 'deceit, negligence and rank hypocrisy' had been laid bare. There are of course detailed, gruesome and humorous accounts of every change in Labor leadership from Beazley to Crean to Latham and back to Beazley. The assessments of Rudd's colleagues are blunt. Beazley 'sent the party to sleep. He was like a warm pair of fluffy slippers. But worse than that, he didn't want to remind the party, or the country, of the deep social and economic dislocations what were the inevitable consequence of the hard-fought gains of the policy reforms' of the Hawke/Keating era. Ouch! Australian politics has become a deadly sport. And perhaps it was always so. Rudd lived by the sword in this volume, and we await the next volume to see how he died by the sword. Through it all, he has proudly professed his Christian faith. He went onto the public field to play this deadly game in order to make a difference. It's his family and his faith which have sustained him every step of the way. His family has paid a price and he feels that deeply. And he knows it's deeply unfashionable to be a political leader professing any sort of religious faith: 'the view in polite post-Christian society is that religious believers are emotionally fragile, scientifically illiterate and morally hypocritical. But apart from all that, we believers can be perfectly pleasant, although totally delusional, human beings.' Classic Rudd! "For those who are not faint-hearted and who enjoy blood sports, progressive politics, says Rudd, is about experience, reflection and action, and not 'a permanent intellectual seminar, or a rolling café society conversation about what others should be doing'." He acknowledges 'the simple truth' that 'Christianity no longer represents a shared epistemology for the common deliberations of a secular parliament, if in fact it ever did'. He concedes that 'the ethical views I might derive from faith must equally be explicable in the absence of some mystical recourse to divine revelation'. For those who are not faint-hearted and who enjoy blood sports, progressive politics is about experience, reflection and action, and not 'a permanent intellectual seminar, or a rolling café society conversation about what others should be doing'. This book is a call to arms in the Labor Party, and it might even inspire some who vote for other parties as well. View Fr Brennan's 2010 live conversation with Rudd, hosted by Eureka Street, here. If this Christian had shown the same forbearance towards his successor as party leader as the atheist Bill Hayden did to his, and stayed out his tenure as foreign minister without complications until the 2013 election, he could well be a Gillard-appointed governor-general today or in the running for one under an ALP or Coalition government. The largesse that John Howard's privatisation of employment services delivered to Therese Rein's entrepreneurial skills should have planted honour (of noblesse oblige) rather than hubris (albeit wounded) in his footsteps. "... a space for faith tempered by reason" Some might say there is no possible association of faith and reason - that they are irreconcilable antitheses! Kevin got at least one thing right - the condemnation of Howard for the Iraq invasion in the coalition of the moronic and small minded. His moving apology to the Aboriginal people wasn't too bad either. 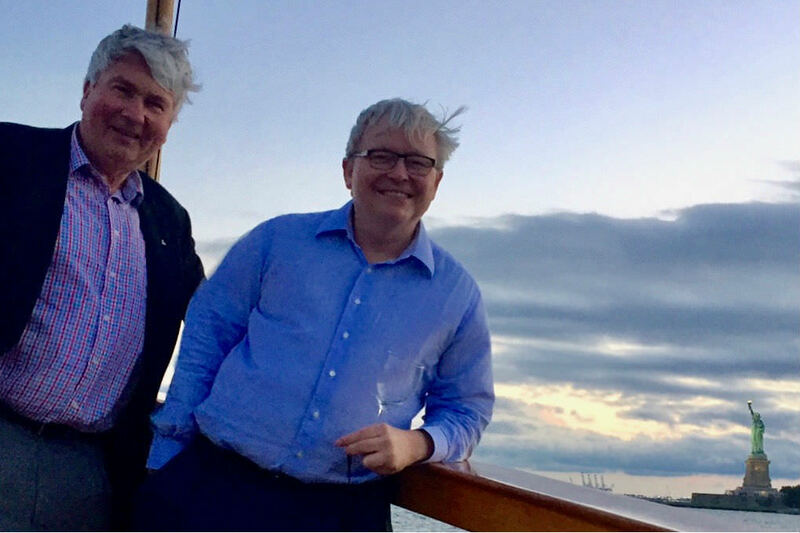 Frank, the great thing about the relationship between yourself and Kevin Rudd is that the heart of it all is friendship. You have faith in common and an interest in politics and I can tell from the picture that you are both admirers of the Statue of Liberty. I've seen her myself and she's a fine lady (if a little weather-beaten). Many politicians make strong statements about their religious beliefs and act on them. Tony Abbott and Kevin Andrews, on the opposite side of politics to Kevin Rudd, have done so. I find Kevin Rudd's religious discourse very similar to that of some people during meetings of the SCM (Student Christian Movement) at university in the late 1960s and early 1970s. Decent, ethical stuff of high social concern. The sort of discourse, slightly updated, you would hear from any decent Anglican, Uniting Church person and progressive Catholic today. But does it resonate within? Does it change people? Paul Keating, as far as I am aware, has made few, if any, public statements of his religious beliefs, but his public stance and statements against the dreadful euthanasia legislation currently before the Victorian parliament marks him as someone who has been deeply affected by traditional Church teaching on the matter. This issue is one of those last ditch battles to save the now rather tattered rags of Christian civilisation which still cling precariously to our society. Of course KR did make the Apology but we are still desperately trying to come to terms with what was historically done to ATSI people. When Kevin Rudd came to power in 2007 he promised action on climate change and with Malcolm Turnbull as leader of the opposition there was the perfect opportunity to achieve bi-partisan action on what Rudd had called the most important issue of our time. Instead Rudd chose to play politics and use the issue to wedge the Opposition. In Tony Windsor's words "Rudd gave us Tony Abbott." I remember attending a community Cabinet meeting in Townsville when Rudd was at the height of his popularity. All the Cabinet were there and there was the opportunity for the audience to ask questions. For over an hour Rudd answered virtually all the questions and twenty or so Cabinet members sat there like dummies. Ridd could not resist the opportunity to show off how smart he was. Rudd squandered the opportunity given to him by the Australian people because of his bloated ego. It will be interesting to see how he writes about this in his next book. I read this article the morning after Kevin Rudd appeared on QA and a week after Father Frank appeared on the same program. Many of the Twitter comments on Rudd accorded with my own. "Why couldn't he have spoken like that when he was PM?" The answer of course was Factionland - the ongoing blight on the ALP. For more insight on this I recommend Graham Richardson's book Whatever It Takes. And the Tweets on Father Frank indicated that many ex-Catholics would consider returning to the Church if it had more priests like him. I spoiled in that I was educated by Jesuits and had dealings with many Jesuits throughout my adult life. Several characteristics of the Jesuit approach to intellectual questions impressed me. Be prepared to see both sides of an argument. Try to put yourself in your opponent's shoes. Know your audience. Or if it was a court case - know your judge. Spiritually we were taught to try to ascertain what God's will was for us in any particular situation. To seek through daily prayer and mediation a closer contact with God (more specifically Jesus, as befits the name Ignatius chose for his new order, Societas Jesu). I have great hopes for the future of Catholicism and Christianity with a Jesuit Pope like Francis. Kevin Rudd is fortunate to have an ally in Father Frank. Unfortunately PM Kevin Rudd followed PM Howard's just months old Intervention into the lives of Aboriginal people in the Northern Territory for far longer than Howard was able to. Over 95% of Aboriginal people in the NT voted for Kevin Rudd's Federal Labor government sure in the belief that Howard's Intervention would be disbanded and incredulous when Rudd's government did no such thing. Aboriginal lives continued to be devastated (and to the nation's shame still are) by not only the wellknown aspect of Income Management by the BasicsCard, but on almost every aspect of life. Self governing Community Councils substituted by highly paid flyin/flyout Government Business Managers ('what you've done is taken away empowerment'); community living areas forcibly leased; huge pressure exerted to extend to 99 year leases. Widespread consultations (All we talking about is our survival') were ignored. The permit system changed. The beginning of the end of the 20 year old Aboriginal work for the dole scheme CDEP ('the cutting of CDEP...force a lot of the Aboriginal educators out of the schools') became another carried on strategy. The recommendations of United Nations bodies and almost incredulous visitors ignored. Sadly hopes for change under PM Rudd's leadership were completely lost. It has to be said that Kevin Rudd was a far more progressive PM than John Howard and Tony Abbott was or Malcolm Turnbull is. The high point was the very moving apology to Aboriginal Australians. I saw his speech on a screen and witnessed many who were very visibly moved by his words - words that were long overdue. Many black and white Australians exchanged hugs. Sadly, these moving words were not followed by meaningful action. He could have taken steps to restore an Aboriginal decision-making body like ATSIC (which had been abolished by John Howard) so that Aborigines could have a consultative body again so that services to them could be improved However, his policy on asylum seekers was not all that much different to the callous one adopted by the LNP Coalition. After one harsh comment he hade about asylum seekers, I made the comment that he must have thought that he had the extra letters - "o", "c" and "k" at the end of his name. This was a reference to the former immigration minister, Phillip Ruddock, whose policies towards asylum seekers were inhumane. Both the Ruddock and Gillard governments did nothing to change the very unfair maritime boundary between Australia and Timor-Leste foisted on them by John Howard and Alexander Downer. I am glad that Kevin Rudd was a great admirer of Dietrich Bonhoeffer, the courageous anti Nazi martyr, but I think that if he was so inspired, he could have implemented more humanitarian policies than what he did.